After you made a high score in Jump Hero you have the option to upload your score to the global leaderboards. The benefit of this simple but fast cross-platform ranking system is that you don’t have to register yourself for uploading your score to the leaderboards. The downside is that there is a possibility that other players will use the same name. To overcome this problem choose an unique name for your high scores. 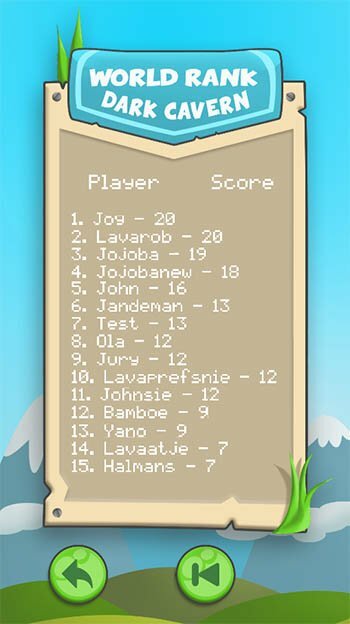 If the game has some succes in the stores there might be a possibility that I will take a closer look at this simple leaderboard system and integrate a more robust version. The 50 best players from around the world will be shown inside of the game. On this website you have the option to check out the top 1000 ranks. Click here to go to the leaderboards.